When it comes to traditions, no matter how modern one tries to be, no one can negate that we always find comfort in our roots. Weddings are no different. Being in the discourse of Hinduism, one should know the basics of the Hindu weddings as described in the Manusmriti. Manusmriti which is the Sanskrit word for “Laws of Manu” .”The Remembered Traditions of Manu” is one of the most authoritative books of the Hindu code in India. The book is attributed to the first man and law giver whose name was Manu. Brahmana – In this type of wedding in the Manusmriti, the father of the bride or her guardian gives her away to the bridegroom after embellishing her with costly garments and jewels. The bridegroom is chosen after much scrutiny, some of the criteria of choosing a suitable bridegroom is him being well versed in the Vedas and being endowed with noble qualities. The father of the bride also honours the bridegroom by offering to him a traditional drink made out of honey. This is the most supreme type of Hindu wedding. 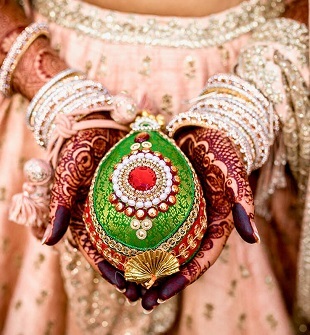 Daiva – The bride is decked in heavy ornaments and given with gratitude to a priest in turn for performing some ritual. This type of marriage is also deemed to be degrading by some people as it is believed to be degrading towards womanhood. 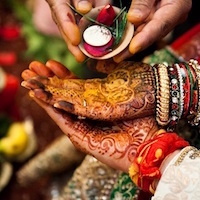 This is so, because if the bride is unable to find a suitable groom then, as per ritual, she will be married off through the process of matchmaking. Arsha – The bridegroom presented the father of the bride with a gift which was usually a milking cow and a breeding bull. This gift, which has been permitted by the sacred books of law was regarded as a token of appreciation and not a dowry. This gift was significant in earlier times because dairy cattle was a main source of wealth. 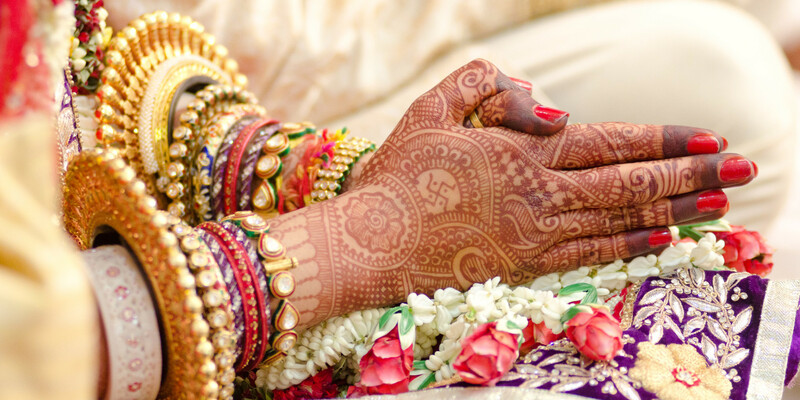 For this type of wedding in the Manusmriti, the bride was usually given away to a sage. In exchange for the bride the family bride used to be gifted with cows. 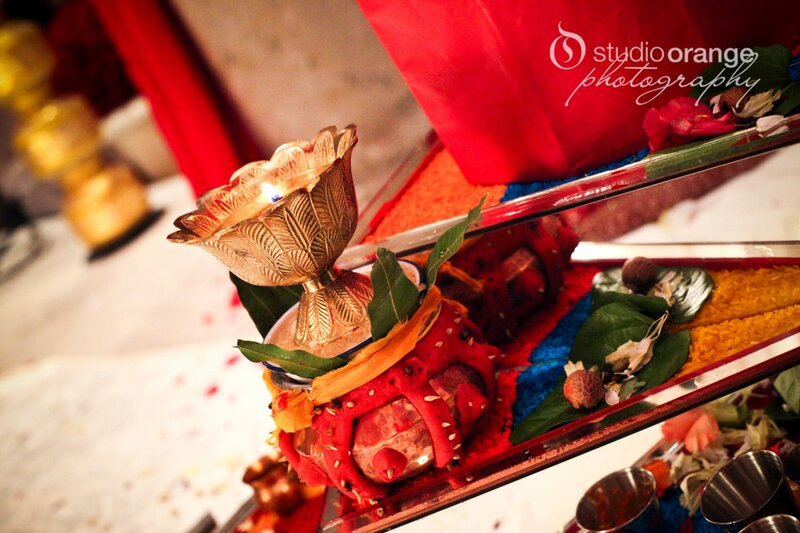 The practice of this type of wedding is mentioned in the numerous instances of the Mahabharata. 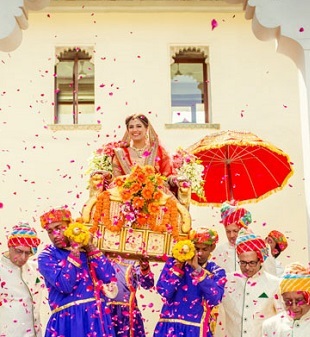 Prajapatya – The father of the bride gives his daughter away to the bridegroom along with a traditional blessing which goes “May the both of you perform your duties together”. A traditional drink made from honey is also offered to the bridegroom as a way of honouring him. 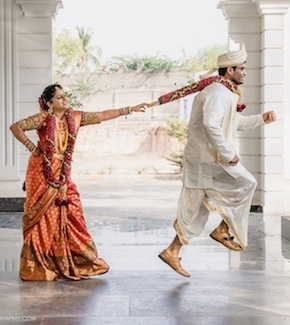 Unlike other weddings in the Manusmriti, the father of the bride searches for the bridegroom, whereas the common practice is for the groom to look for the bride. Gandharva – In this form of wedding in the Manusmriti, the bride and the bridegroom are married in secret with no knowledge of the parents on either side. It is a voluntary union of both the bride and the groom and can be considered similar to what is known today as a love marriage. The ceremony of the marriage can be done in the presence of a person, tree, creature or a deity. Asura – The bridegroom volunteers to give as much as wealth as he can afford to give to the bride and her relatives. After this transference of wealth, the bride can become his wife. The exchange of these gifts is not in accordance with what the sacred law induces. This was not approved by Manu, the law giver, because he thought that this was buying the bride and not entering into a married life with consent. In this kind of marriage, the groom need not be compatible with the bride. He may be suffering from some disabilities or have an indispensable character, but as long as the greed of the father of the bride is satisfied the wedding takes place. Rakshasa – In this type of wedding in the Manusmriti, the girl was taken away by force from her family and later on persuaded for marriage. Paishacha – This is a type of marriage where someone marries a girl whom he has seduced while she was asleep, intoxicated or insane. This kind of marriage has been looked down upon. It can be compared to a way to a way of molesting women because of the utter force used in the marriage, and is thus named so.